Kilauea is one of five volcanoes on "Big Island Hawaii". The shield volcano is located in the southeast of the island and is currently active. He was long considered to be a satellite of volcano Mauna Loa. Only a few years ago volcanologists discovered the independent plumbing system of Kilauea. This ranges up to 60 kilometers deep. The entire archipelago of Hawaii owes its existence to a hot spot. This magma tube begins in the mantle and has melted a path through to the surface. Under the Pacific this "hot spot" breaks through the oceanic crust and creates a chain of volcanoes. 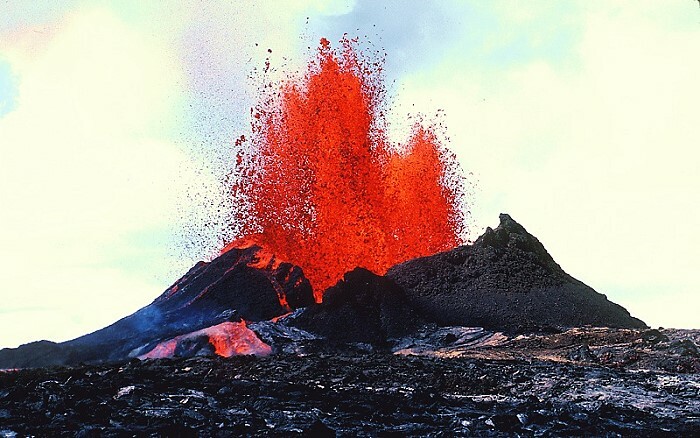 The youngest volcano in the chain, which is above sea level, is the Kilauea. His age is not known exactly, but his first submarine eruptions are likely to be more than 300,000 years ago. Since that time it grew up from 3700 meters deep ocean floor. 100,000 years ago, well he broke through the sea surface and then made it to an altitude of 1219 meters. Kilauea volcano has been Hawaii's most active volcano during historical time and is one of the most active volcanoes of the word. The 3 x 5 km caldera at the summit of Kilauea is a relatively young one. It's formation took place in several stages about 1500 years ago. In the Caldera, the main crater of the volcano was formed. The crater is called Halema'uma'u. This name comes from the Polynesian and means "house of fern". 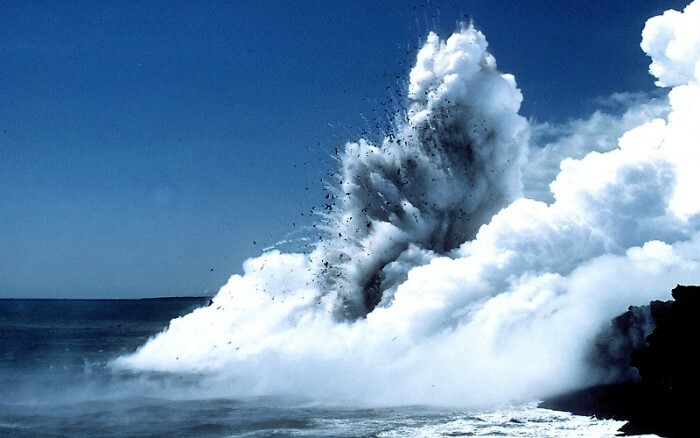 Eruptions of Kilauea are prominent in Polynesian legends. The volcano goddess Pele lives in Halema'uma'u-Crater. After their hair the characteristic lava threads were named. Written documentation extending back to only 1820 records frequent summit and flank lava flow eruptions that were interspersed with periods of long-term lava lake activity that lasted until 1924 at Halema'uma'u-Crater, within the summit caldera. Written documentation extending back to 1820. They records frequent summit and flank lava flow eruptions. These periods were interspersed with periods of long-term lava lake activity within Halemaumau crater. This activity lasted until 1924. 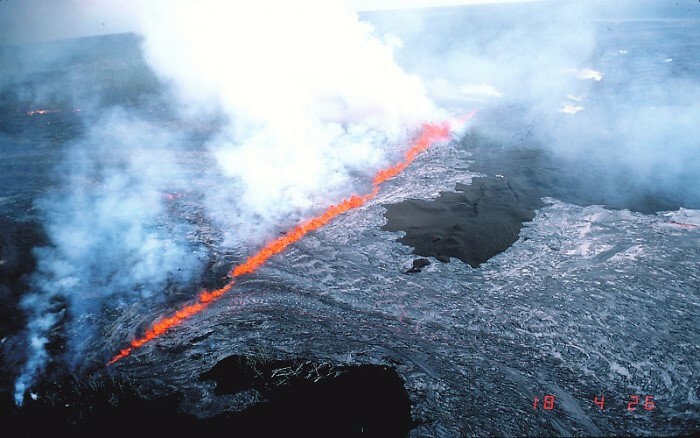 In 2008 had begun a new period of lava lake activity. The lava lake is activ in recent days. During the 18th century, eruptions have also originated from the lengthy East and SW rift zones, which extend to the sea on both sides of the volcano. About 90% of the surface of the basaltic volcano is formed of lava flows less than about 1100 years old; 70% of the volcano's surface is younger than 600 years. A long-term eruption from the East rift zone that began in 1983 has produced lava flows covering more than 100 sq km, destroying nearly 200 houses and adding new coastline to the island. This eruption had formed the famouse Pu'u 'O'o-Crater.